There have been many attempts by the mass media and some politicians to vilify US President Donald Trump, including labeling him as Adolf Hitler. 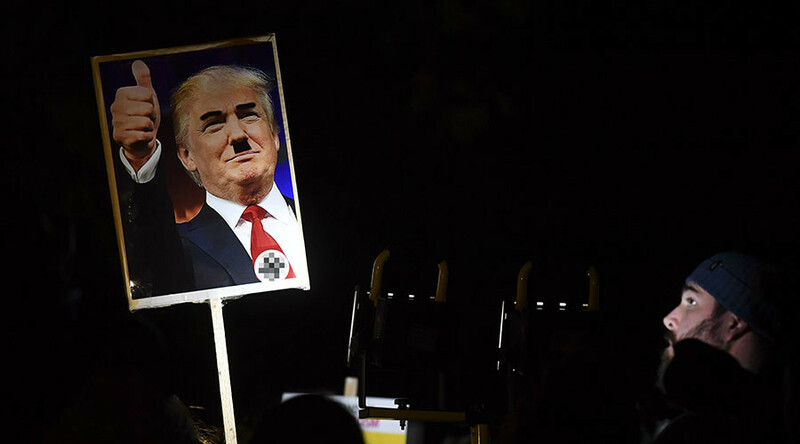 One historian has gone so far as to suggest that some of the US President's views might have been drawn from Mein Kampf, the autobiographical book by the Nazi Party leader. RT: In recent months President Trump’s critics haven't been able to resist this particular comparison. What do you make of that? Patrick Henningsen: Well, the ‘Hitlerization’ – for the lack of a better term - has become a type of celebrity reporting. In other words, the term has become almost meaningless. It is a kind of comical characterization of someone in the past. There have been many Hitlers. Right now it’ll be Donald Trump; in Europe, it’s Vladimir Putin; Viktor Orban from Hungary has been called Hitler. Anybody who is populist, or leaning nationalist – Nigel Farage, another Hitler; Marine Le Pen, a potential Hitler there, as well. And the US has branded many Hitlers recently [Bashar] Assad, another Hitler; [Muammar] Gaddafi… Manuel Noriega. We can go back to the 80’s: Hosni Mubarak, Ben Ali. Viktor Yanukovych, former President of Ukraine – another Hitler; Slobodan Milosevic… And the list goes on and on. In the case of America, through the media people are told every day that Trump is threatening their American identity, as it were. So again, the Hitler appropriation is made toward Donald Trump. So it is equating populism with fascism, but then it is not really related to fascism in a historical sense or political sense, and again a label. It doesn’t address National Socialism, which was what Hitler’s party was. Hitler was a fascist. It all becomes meaningless very quickly. ‘Hitlerization’ - the term has been weaponized. The term fascism has been weaponized. In the case of America, we apply the term ‘Hitler’ to make the aggressor appear like the victim. Certainly, this would be the case in Europe and US foreign policy in terms of Ukraine and Russia. In other words, the US has orchestrated a coup in Kiev: tremendous backing, covert and political to topple an elected government there. But then we’ll use this ‘Hitlerization’ of Vladimir Putin to make it look like Russia was the aggressor when it was the opposite – the West was the aggressor and destabilized Ukraine and created this situation, which it is today. RT: The mainstream media hasn't pulled any punches when it comes to President Trump's policies from front pages depicting him beheading the Statue of Liberty to news pundits pondering the impact of his assassination. Do you think people buy into these stories? — RT America (@RT_America) 9 февраля 2017 г.
PH: In terms of the people who believe or buy into the Hitler label, or buy into the fascist label, as it is universally applied these days in a kind of commercial sense, there is validity to it. In other words, they do believe Donald Trump is the reincarnation of Hitler, because the media tells them that every day. And certain politicians are using that as a sort of a term of scorn against Donald Trump. So for them it is very real. But the reality is when you dig down, and you scrape away all the rhetoric and the hyperbole, we have a President Donald Trump in America now, who is basically courting labor unions. This is the antithesis, some might say, of fascism – certainly something that Hitler didn’t do in his rise to power in Germany. So Trump is basically recapturing a portion of the electorate, in this case you could say the white-working class, but really any working class union people that were basically cast aside by the Democratic Party over the last 20-30 years in favor of an expedite corporate policy, or the corporatization policies that created off-shoring of US jobs, which gave credence to what Trump’s campaign was all about. The media has completely inverted – they have basically turned reality on its head by using these terms like “the next Hitler,” or “Fascism.” The language has been rendered completely meaningless now; it’s just a hyperbolic label.